Bellydance is good for body, mind, and spirit. Why not spend one night a week (or more) in the company of strong, witty women? Bellydance is a fun, versatile dance form; fantastic for toning and strengthening your core muscles and just an all round rousing night out! This is a mixed level class. Beginning students are introduced to tribal dance & ATS vocabulary and technique. Experienced dancers drill moves, cues, and transitions, expand their improv skills with more challenging formations and combinations. Everyone works on choreography and practice with various props (veils, canes, and zils). ​Whatever your dance background or experience; you will fit right in! watch for special classes and seminars on various belly dance skills. 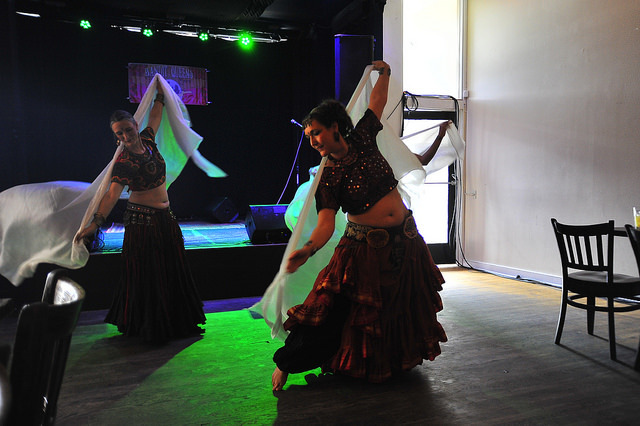 Past workshops include veil work, yoga-bellydance fusion, tassel-making, mirror (shisha) embroidery. Visit the Events page for upcoming topics. Well-rounded dancers study with many teachers over time. Tribal Bellydance is about creating a bond with your fellow dancers and celebrating the beauty within each of us.